View More In Body Repair Tools - Page 2. ◆Unique Design◆ Different size for two sides of the pad---front 7 inch (180mm), back 6.7 inch (170mm)---a specicial design to protect surface from being scratched while polishing, to reduce the abrasion for both pad itself, plate and surface. ◆HIGH QUALITY◆ Prime quality, sponge pad, bendable, washable and reusable. Used for all kinds of coat paints waxing, polishing ,and sealing glaze, to clean and improve their lightness. The biggest advantage for our pads is to lock and remain polishing compound (prevent falling off in high speed). And they have great capacity of heat dissipation. ◆EASY TO USE◆ Can be used in pneumatic or electric polishing machine. Used for Auto car detail polishing. With abrasive stick backing, you can easily change the sponge. They are suggested to be washed with clean water and dried naturally after using. ◆ADVANCED MANUFACTURING TECHNOLOGY◆ Soft and fine workmanship, not damage the surface,Washable and save money. They are light weight and really easy to assemble. made of durable open cell foam which improves airflow, bring out the highest level showcar of shine with the ultra-smooth finishing polish pads. 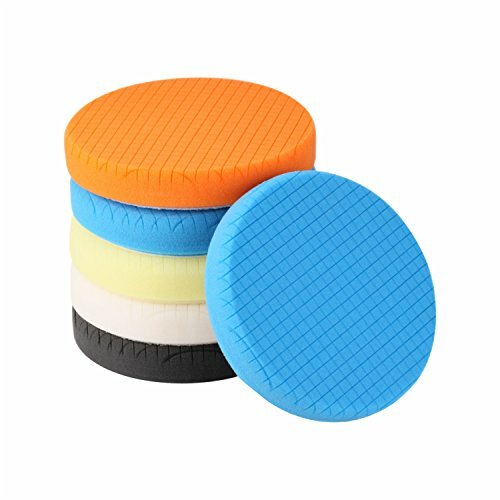 ◆DIFFERENT HARDNESS◆ There are five different colors of the sponge pad with different hardness: Yellow> Orange> Blue> White> Black, efficient cutting and polishing the most difficult car oxidation coating, scratches. If you have any questions about this product by SPTA, contact us by completing and submitting the form below. If you are looking for a specif part number, please include it with your message.